The Namibian Amateur Radio League (NARL) was founded in 1990 which coincides with the independence of the Republic of Namibia. The history of the NARL dates back to 1968 when the then South West African Radio League was branched of the South African Radio League (SARL). A chronic has been compiled for the 21 anniversary of the Namibian Amateur Radio League (NARL) and also in celebration of the 21 independence	anniversary celebration of the Republic of Namibia. This chronic dates from 1968 - 2010. It is an interesting peace of amateur radio in Namibia and can be downloaded below. You will need Adobe Acrobat Reader. Please refer to our News and Bulletin pages for more recent news on what's happening in Amateur Radio in Namibia. The NARL logo is derived from the international symbol for amateur radio, included in the logos of many IARU member societies. The diamond holds a circuit diagram featuring components common to every radio: an antenna, inductor and ground. NARL members may use the NARL diamond logo on their own personal QSL cards, stationery, business cards and websites. NARL logo and images CANNOT be used on any items intended for sale (shirts, mugs, calendars, etc), or as part of advertising or other commercial promotion including websites, eBay listings, etc. NARL logos and images CANNOT be modified in any way or incorporated within any other logo design. 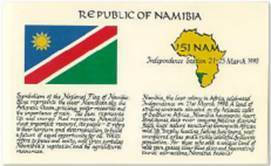 The NARL is the official member society registered at the Internation Amateur Radio Unioun (IARU) for Namibia. Namibia falls under REGION 1: Europe, Africa, Middle East & Northern Asia. For more information see the IARU Website.